A section of the EDC map of the proposed Far Rockaway development area. At a packed information session for the Far Rockaway rezoning proposal on Wednesday night, there were no protest banners and no petitions for alternative plans passing secretly hand to hand. Instead there was enthusiastic applause for Councilman Donovan Richards and the members of the working group who spearheaded the planning effort—with some saying that the revitalization couldn’t start soon enough. “It’s been long overdue,” said Gordon Williams of the 101st precinct Community Council. 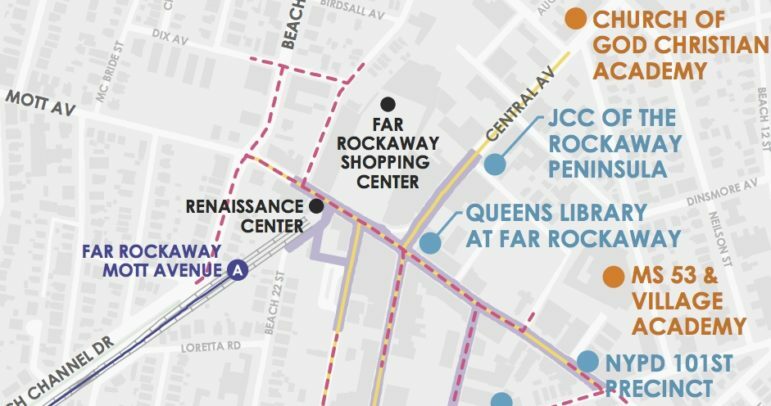 The city’s rezoning proposal for Far Rockaway came together with speed. Richards, perhaps taking a page from Council Speaker Melissa Mark-Viverito’s playbook, launched his own community planning effort in downtown Far Rockaway in the fall of 2015. 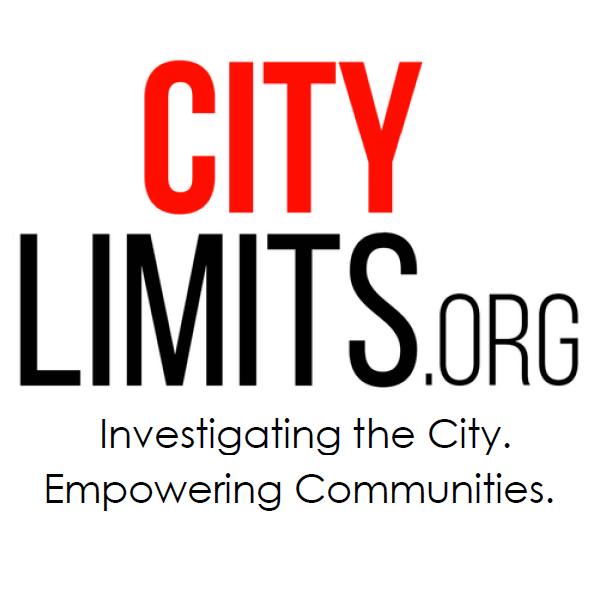 While Mark-Viverito’s community plan for East Harlem took 10 months, eight public meetings, 40 committee sessions and dozens of organizations to complete, Richards and his 15-member working group had finished theirs in three months, with four working group meetings and one public meeting to solicit feedback. On February 1st they sent a letter to Mayor de Blasio with a list of recommendations. Four days later the mayor announced in his State of the City address that he would budget $91 million to spur the revitalization of the Far Rockaways, “the kind of investment this neighborhood has not seen for years,” he said. This spring, while the working group continued to meet, the New York City Economic Development Corporation (EDC) developed a plan in response to that letter and solicited public feedback at another public meeting. On August 19 EDC released a revised plan, making the Far Rockaways the eighth neighborhood that the city has publicly announced it will seek to rezone (the ninth and most recent is Gowanus) but the fourth where the city has already completed a ‘draft scope’ documenting the details of the plan. Richards does not apologize for the pace. He says he was elected on a mandate for change, and that the Far Rockaways is not East Harlem, which he says already has commercial corridors and other resources (and, one might add, is one of the top five gentrifying neighborhoods in the city according to the Furman Center, causing trepidation about more development). “I don’t see myself waiting 20 years to get this off the ground,” he told City Limits on Wednesday. The working group may have moved quickly, but Kevin Alexander, director of the Rockaway Development and Revitalization Corporation (RDRC) and a key member of it, says RDRC has been developing plans to spur commercial revitalization in the area for years. EDC’s plan, he says, “does represent what we envisioned, but more importantly, what the community says it would like to see in the district.” The organization had their own table next to those of city agencies at Wednesday night’s information session. EDC’s Downtown Far Rockaway Roadmap for Action recommends rezoning the long neglected downtown to promote residential and commercial growth. Thirteen acres, or about a quarter of the total rezoning area, would be designated an urban renewal area (URA), as recommended by the working group. This would allow the city to take properties in the URA by eminent domain—the first de Blasio neighborhood plan to propose the use of this measure. EDC says there are a few property owners in the URA, but most of the land is owned by Rita Stark, the landlord famed for holding onto deteriorating properties across Brooklyn and Queens and former owner of the controversial Arlington Village site in East New York. Neighborhood stakeholders have long called on Stark to revitalize her Far Rockaway property, which contains a largely abandoned shopping center. The city imagines recreating the entire URA with a new street network and releasing Request for Proposals (RFPs) for private development. It hopes to facilitate the creation of new retail and community facility spaces, a public plaza, and housing. The scope predicts the creation of 1,740 apartments. The affordability of these units, to be specified in RFPs, will likely be a topic for future debate. Unlike East Harlem’s community plan, which said 20 percent of total units should be for families making less than 30 percent AMI ($24,480 for a family of three), the Far Rockaway working group’s original letter to de Blasio made less detailed recommendations, calling for “mixed-income housing that reflects the diversity of the existing community and prioritizes the needs of existing residents first, while attracting a mix of incomes.” EDC believes community members want a blend of market-rate and income-targeted housing, and currently imagine that 50 percent of the development in the URA will be market-rate and 50 percent will be income-restricted. Outside the Urban Renewal Zone, the city predicts the rezoning may lead to the redevelopment of 17 to 26 privately owned sites, on which the city’s mandatory inclusionary housing policy would require that at least 20 to 30 percent of apartments be set aside for particular income groups. In addition, the city plans to redevelop two publicly owned sites in the rezoning area with 100 percent income-targeted housing. Altogether, including the land both in and outside the URA, the city predicts the plan will create more than 3,000 new units. The exact levels of affordability in these units is yet to be discussed. Finally, the plan includes a variety of measures to address other neighborhood issues. For instance, EDC is bringing in a nonprofit called New America to develop a communally owned Wi-Fi network that would help Far Rockaway businesses communicate internally in the event that a natural disaster disrupts Internet service. The Department of Small Business Services is already dolling out funding to 19 downtown businesses for storefront improvements. Though there was a positive mood at the information session on Wednesday, that doesn’t mean residents don’t have concerns. Lushon Fordyce wonders if local businesses could be pushed out by rising rents. Milan Taylor, founder of the Rockaway Youth Task Force, which participated in the working group, is concerned that without the right levels of affordability, the plan could lead to displacement. One resident at Wednesday’s meeting was distressed that local owners in the URA could lose their properties by eminent domain to private developers. Some others are concerned that an influx of new residents will create parking issues, though EDC says their plan will include adequate commercial and residential parking. In the coming months, EDC will complete an Environmental Impact Statement (EIS) in which it will study the impact of the proposal on the neighborhood. The EIS will also analyze how the area could be affected by climate change. While Far Rockaway did not suffer as much as other parts of the Rockaways from Hurricane Sandy and EDC’s scope indicates that the bulk of development lies outside of a flood plane, there are portions of the rezoning area that could lie in a “100-year flood zone” by the 2020s, which means these areas could have a one percent chance of flooding every year. EDC will analyze how sea-level rise and storm frequency may affect the rezoning area. It helps to sell a plan, however, when you have local organizations and a charismatic local councilman to advocate for its merits. Take Kenny Carter, president of Fathers Alive In the Hood, who wanted to know whether local residents would have access to construction jobs. It took a little while before the EDC representative understood his question, but she assured him that yes, there would be opportunities, and that his concerns would be taken into account. Carter was not so convinced, however, until Richards strode over and declared that getting construction jobs to the community was one of his top priorities, and heralded the work of Urban Upbound, which in 2013 opened a new Workforce1 center in the Rockaways that connects local residents to hurricane-recovery jobs. “She couldn’t give us the answers that Donovan could clearly give us,” mused Carter after the meeting. While the Councilman can pressure developers to make their best effort to hire locally, he has no way to guarantee jobs to local residents. The de Blasio administration, though it has ensured more publicly subsidized development projects are required to make “good faith efforts” to hire Workforce1 candidates, has so far said it would be illegal to mandate local hiring and other labor standards within a zoning text. The city is currently conducting a study on how to create access to good jobs in rezoning areas. Community members will have another opportunity to comment on the plan at a scoping hearing on Tuesday September 20 at 6:30 pm at St. John’s Hospital, Bocces Conference Room, 327 Beach 19th Street. EDC’s plan can be accessed here and the draft scope here. I strongly believe that Downtown Far Rockaway needs to be rezoning, because at Queens already is full with the population. For protect the environment Far Rockaway needs rezoning. The limited scope, curious criteria and advisory nature of those studies has some community advocates worried the city will miss the problems Mayor de Blasio’s zoning changes could cause. Some residents want commercial development, but are concerned about the impact of new housing. Others support residential development, but don’t agree on whether it should serve the poor or middle class. At a conference on displacement, the city and advocates split over whether public and private development is a cause of residential displacement, or a potential antidote to it.